Material: .020 Thickness - Create flat, flexible magnets in any shape you desire through three easy steps. First, create your shape and message. Then, send us your artwork, message and specifications. 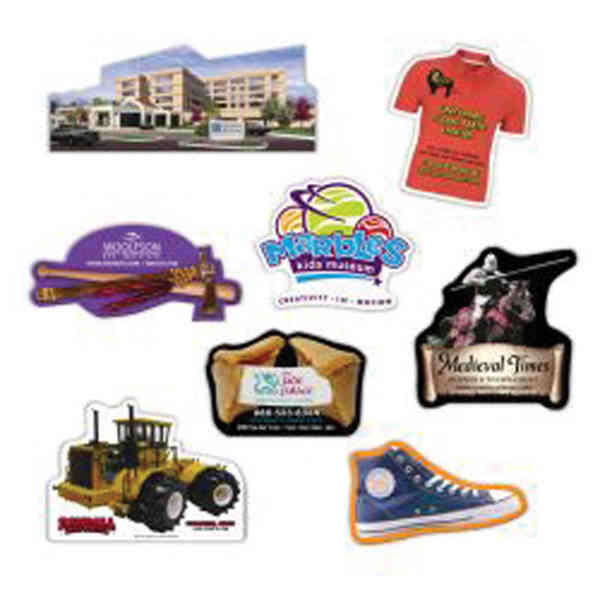 Lastly, we'll produce the custom-shaped magnet by your specifications. There's free tooling and no additional tooling, set-up, or die charge for generalized shapes. Measuring approximately 0.020 in total thickness, the magnets feature a wide range of options. Your business will get repeat exposure when the magnets are seen on fridges, filing cabinets and many other metal surfaces! Size: 3.25 " x 4 " x .01 "
Price Includes:4CP imprint on white surface. For PMS colors please call customer service.